A blog about my adventures of living on the road! Be sure to read the previous post(s) in this series so you’re all caught up on terms and things. So we talked about what Winterizing means, why we do it, and HOW we do it. Now let’s talk about how to balance winterizing with using your RV in cold weather. Leave plenty of room for expansion! For me, this means having tanks that are no more than 2/3 full at any time. I keep my fresh water tank 2/3 or less, and dump my waste tanks (Gray and Black) at no more than 2/3 full. I like to keep all my stuff at 1/2 or less, but 2/3 gives you more room to store if you need it. I like to leave my sewer hose connected as long as i’m at one site, and just open/close the valves as needed. In this case, I leave my gray tank valves open so the gray tank drains as soon as liquid gets in there; no chance of sitting water freezing if there’s no water sitting in those tanks! DO NOT do this with your black tank. In freezing conditions, I drain my black tank at 1/2 full. (Another post on how to drain your black tank effectively). Keep the belly warm, too. Running the on board furnace is a good way to keep the underbelly area warm, which means your tanks and pipes won’t freeze. It’s also a good way to use a lot of propane quickly. I find that an oil-filled heater inside the RV does a great job at keeping the whole place warm, including the underbelly, even from inside the RV. (More on heaters here). When it’s above freezing during the day, and freezing at night, i’ll wait until after my shower, and any other heavy water use things (washing dishes, laundry if you have that option) are done, and then i’ll disconnect my fresh water supply hose. Once i’m disconnected, i’ll open all the faucets, and leave them open. By doing this, i’ve relived the water pressure in the lines, so they’re not quite full anymore. Then, i’ve left an opening for water to escape the lines as it expands, IF the water in my pipes starts to freeze. The big key here is that if i’m in the RV, it should be warm enough for me to sleep comfortably, which means 52 degrees or above (Below 52 I tend to get a little cranky when I sleep without my arctic sleeping gear). So there you have it, the secret to keeping your RV pipes in good shape while camping in the cold! Winterizing: How do I do it? If you haven’t already, be sure to read the previous post(s) in Winterizing to make sure you’re up to speed on parts and terms. You’ll want to dump your holding tanks, flush them out really well (i’d flush the black tank at least three times to get all the gunk out!) and make sure they’re completely empty. To do this well, i’d leave the sewer connection in place and all the valves open after i’ve flushed the tanks, just to make sure any residual water gets into the sewer system. Drain your fresh water tank. Somewhere on your RV there will be something called a ‘low point drain’, and this is simply a drain at the lowest point of your fresh water system. Open this drain, and let the water flow until it doesn’t flow anymore. While this is going on, you want to make sure you’re disconnected from city water supply, so no water is coming INTO your RV. I like to open all the faucets while this is going on (Kitchen sink, bath sink, shower/bath, outside) to help water drain from any low points in the faucets, and to provide plenty of air flow for the water draining out of the bottom of the fresh water tank. You can also turn on the water pump to speed up the process, but you must be careful to turn it off as soon as the water level gets low so you’re not running your pump dry (more on that in another post). Last thing I do is drain my water heater. There’s usually a drain valve on the water heater, accessible from the outside access panel for the water heater, and you can open this drain and let the water out. Some people like to take out the heating element as it’s usually mounted low in the tank, and while it won’t hurt anything, it’s not necessary if you opened the drain. So there you have it, three easy steps to winterizing your RV! You can leave the drains open so that any moisture collecting in the lines or tanks can drain out of the RV. Make sure you use some kind of bug/pest repellent since there’s openings into your RV when you do this. You don’t have to, and probably should NOT, leave the sewer connection hose in place. I like to disconnect mine and hang it up/over something so it will completely dry out, and then store it in a way where it can drain, but is not left in the stretched position. This series is all about Winterizing; what it is, how to do it, why it matters, how to mess it up, and most importantly, WHEN to do WHAT. Anyway, let’s jump in. Winterizing refers to preparing your RV (or boat, summer cabin, or other stuff you don’t usually use during the winter) for the cold that causes liquids to freeze. Here’s the part where I point out the importance of words, specifically this line right here: The cold that causes liquids to freeze. See, the entire point of winterizing is to prevent freezing liquids from causing damage, because when liquids freeze, they EXPAND, and when they EXPAND, they can break whatever is trying to hold them in, like pipes, tanks, hoses, and the fittings between those pieces. 3) Black Water – The tank that holds Black water (sewage) from your toilet. 2) Drain pipes – pipes that DRAIN water from various parts of your RV to the appropriate holding tank. It’s important to understand the difference between SUPPLY and DRAIN pipes, most notably that SUPPLY pipes are under pressure, because it’s this pressure that can cause the most issues. 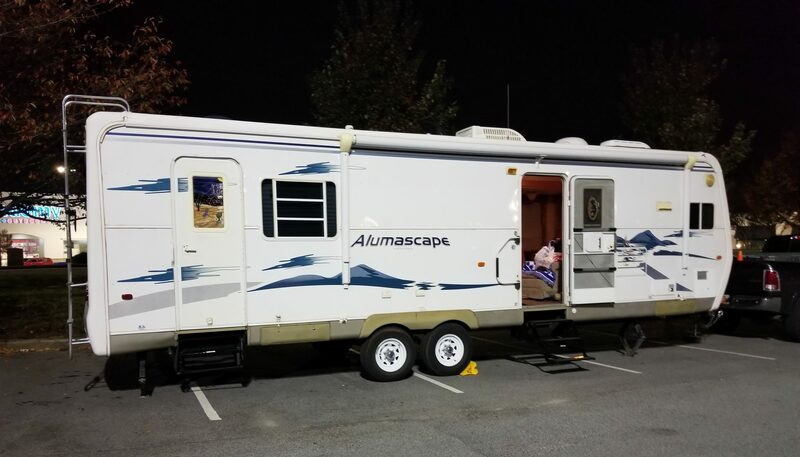 Read on through the series to see more great posts about winterizing your RV. To drive, or to tow….